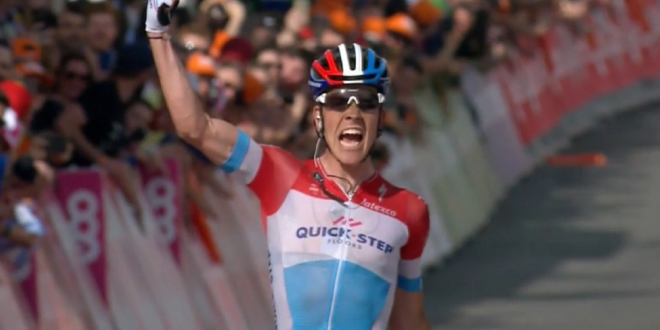 Bob Jungels (Quick Step Floors) takes the succes at Liege-Bastogne-Liege 2018! The Luxembourgian gets the victory of La Doyenne solo after 258 kilometers of racing. Quick Step Floors’ all-rounder went clear with over 19 kilometers remaining on the summit of the Cote de la Roche aux Faucons and have sat in the lead until he crossed the finish line. 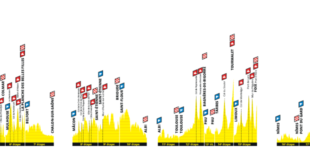 Quick Step Floors completes in this way a fantastic week in the Ardennes after having taken the success Wednesday at La Flèche Wallonne with Julien Alaphilippe. 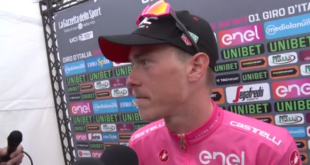 Michael Woods (Education First – Drapac) finished in second whereas Romain Bardet (Agr2 La Mondiale) in third: this duo attacked with over 2 kilometers to go. Julien Alaphilippe (Quick Step Floors) finishes at the foot of the podium: the big favourite of Liege-Bastogne-Liege takes the fourth place. Alejandro Valverde, on the other hand, didn’t succeed even in taking a top-10 position: the Spaniard finished in thirteenth. The desire of those who are aware they’ll not be competitive for today’s victory to show off didn’t give the race any time to settle down. 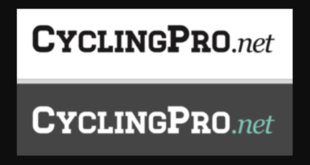 Loic Vliegen (BMC Racing), Anthony Perez (Cofidis), Mark Christian (Aqua Blue Sport), Casper Pedersen (Aqua Blue Sport), Florian Vachon (Fortuneo – Samsic), Jerome Baugnies (Wanty – Groupe Gobert), Paul Ourselin (Direct Energie), Mathias van Gompel (Sport Vlaanderen – Baloise) and Antoine Warnier (WB Aqua Project – Veranclassic) attacked in the very early stage of racing and opened a maximum advantage of 6’10’’ over the group after 38 kilometers of racing. The break went all together until the Cote du Pont was hit with 90 kilometers to go: Casper Pedersen went clear, Antoine Warnier attempted to chase the Dane and Mathias van Gompel dropped the leading group. This situation didn’t last long. In facts Pedersen was reeled in by the chase on the top of the Cote de la Ferme Libert. Warnier was the second to throw the towel after van Gompel and shortly after also the U23 former European champion, together with Vachon, dropped the break. The same fate has fallen to Loic Vliegen on the Col du Rosier: in this manner only four riders remained in the lead of the race. While Movistar, Lotto – Soudal, Mitchelton – Scott, Bahrain – Merida, Team Sky and Quick Step Floors were trying to seize the front positions of the peloton on the way to the Col de la Redoute, Jerome Baugnies moved an attack from the leading group and went solo with 28 kilometers to go. The Belgian passed in first through the summit of the Col de la Redoute when the only noticeable highlight in the back was Wout Poels dropping the peloton. The peloton swallowed the chase soon after but Baugnies was chased with just over 22 kilometers remaining. In facts the injection in pace at the front of the group moved mostly by Bahrain- Merida allowed the bunch to call off Baugnies’ try. On the Cote de la Roche aux Faucons Philippe Gilbert was the first to make a move. Sergio Henao bridged the gap to Gilbert and went clear. Only Bob Jungels, Michael Woods and Jakob Fuglsang were together with the Colombian on the summit of the climb. In a matter of one hundred meters a group of sixteen chased the four in the lead. At this point of racing, with over 19 kilometers remaining, Bob Jungels moved a counter attack. At first Daniel Martin and then Tim Wellens tried to jump across the gap but without success so far. 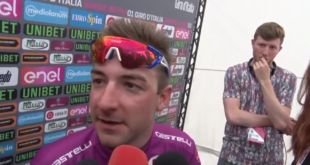 When Nibali, Matthews, Uran, Benoot and Gilbert were certain to be definitively cut off from the fight for the victory, the first chasing group was already 40” behind the leader. At the bottom of the Cote de Saint-Nicolas Wellens struggled to increase the pace: Lotto – Soudal rider’s move opened the road to his teammate Jelle Vanendert, who attacked with success. Flèche Wallonne third finisher’s move allowed himself to reduce the gap to Jungels to 15”. Once the race went back on the road to Ans, the Belgian’s pedalling was weak and the gap returned to 30”. Alaphilippe ad Formolo took advantage of the indecision at the back but didn’t succeed in opening a gap. Romain Bardet and Michael Woods, instead, achieved in going clear with 2 kilometers to go. The duo in the chase dropped Vanendert on the final climb to the finish line but Jungels was actually too far. The Luxemborgian was still 40” ahead of Bardet and Woods when he passed through the flame rouge and approached with pretty much ease the last kilometer of racing before crossing finish line solo. The chasing group jumped across the gap to the attackers but didn’t succeed in prevailing on Woods and the Frenchman.